I wrote this review for Bookmans.com in the summer of 2012 after reading The Island of Doctor Moreau aloud with my then 12-year-old son. When Bookmans did a website redesign earlier this year and migrated their website database, we unpublished all but 30 posts. I tweaked this post to park it here for now. According to The Literature Network, The Island of Doctor Moreau (1896) by H.G. Wells, deals with themes of eugenics, the ethics of scientific experimentation, Darwin’s theories and religion. But it’s summer and who cares about vivisecting literature? We care about enjoying a good book, so we’re providing our own guide to The Island of Doctor Moreau. First, a summary so that you don’t get lost. The story is narrated by Edward Prendick, a shipwrecked man rescued by a passing boat and left on the island laboratory of Dr. Moreau. Moreau creates sentient beings from animals via vivisection. Themes include pain and cruelty, moral responsibility, human identity, and human interference with nature, which makes it a fitting read during the dog days of summer. We take a firm stance against animal cruelty in this home and suffering the panther’s experience in the House of Pain was tough on our soft hearts. 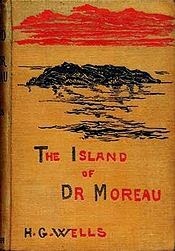 My 12 year-old expert, advises that The Island of Doctor Moreau be read aloud, preferably with a British accent and definitely with friends because the captain who dumps Prendick on Moreau’s island curses like a sailor, literally and figuratively. He also suggests that you and your buddies get psyched up by chanting, “Are we not men? !” before tackling each chapter. The best part of this exercise is that, “it makes you sound less like men.” We’re cool if you lightly skim the part weighted down with Moreau’s rant on scientific ethics. Additionally, the time-honored tradition of reading a classic by watching the movie is extra fun in this case because the movies are extra not right. The first English language film version is Island of Lost Souls (1932) starring Charles Laughton and Bela Lugosi. It is reported that Wells was delighted with it, especially due to its ban by the British Censor. We aren’t a fan of censors either. This adaptation renames Prendick, adds a beautiful panther woman and includes a rescue. Even with the changes it’s regarded as the best movie adaptation. In 1977 a film version starring Burt Lancaster and Michael York has Prendick again renamed, which begs the question, what is wrong with the name Prendick? Maybe the different name helps him land the love interest, who was not in the book. The latest film version stars Marlon Brando and Val Kilmer (1996). This movie brings the crazy. Moreau is not just scientifically curious but plum nuts. Professor Lupin plays Still Not Prendick (or even Parker or Braddock) but he discovers were-love too. None of these movies will help you pass the lit quiz, so just read the book unless you have the obsessive need to compare and contrast. In that case, watch the movies back-to-back. Extra fun facts: Professor McGonagall is not an H.G. Wells fan (~3:20). Also, we’ve never seen it but apparently a young Tim Burton was inspired by The Island of Doctor Moreau. Perhaps other adolescent boys will likewise find inspiration in the book.